SunPower claims to have the most efficient panels in the world. The American solar energy company announced that it can produce highly efficient solar panels that can convert 22.8 percent of the sun’s light into electricity and can generate 70 percent more energy in the same space, compared to less efficient panels, over the first 25 years. According to SunPower, that is a new world record, reported Fortune. Panels with greater efficiency use less material. 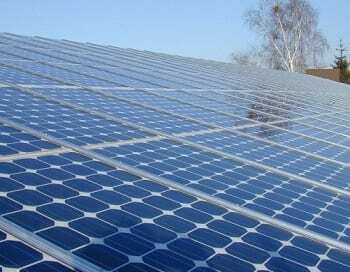 The more efficiency solar panels have, the fewer materials are required to make them. The reduced amount of material required in a panel’s construction means that it requires less space when being installed. In other words, rooftops with highly efficient panels need fewer panels than those covered in less-efficient ones. However, in spite of having less panels, the same amount of energy is generated. The average solar panel has between 15 percent and 18 percent efficiency, but SunPower says that, during the course of an installed panel’s first 25 years, the company’s high-efficiency panels can produce 70 percent more energy in the same space than panels will lower efficiency. SunPower, as well as its competitors, have been working to increase the efficiency of PV (photovoltaic) panels to better capture sunlight, by using different technology including material science and optics technology innovations. Multiple companies have claimed to have produced solar panels with the highest efficiency. This isn’t the first time SunPower has claimed that it has produced panels with the best efficiency. Furthermore, before it announced its breakthrough, Panasonic claimed, late last year, to have produced the world’s most efficient rooftop panels with a module efficiency of 22.5 percent. Interestingly, Panasonic swiped the title from SolarCity, who made the claim a week before Panasonic’s announcement that its panels achieved 22.04 percent efficiency. SunPower says its 22.8 percent solar panel was verified by the federal National Renewable Energy Laboratory (NREL). While it seems that SunPower once again holds the world record for having solar panels with the highest efficiency, considering the competition in the solar energy industry, it won’t be surprising if the company’s doesn’t hold on to the title for long. Increasing electricity production a 70% is no small feat but I can’t help but wonder if this “benefit” might be offset by any cost increases of the new, more efficient solar panels. I noticed that SunPower didn’t mention whether these new solar panels of their’s will cost more then lower efficiency panels.